"Lost a key player in Hogan but balanced their team beautifully. May and Kolodjashnij will be good but still confused by the Preuss selection." How is everyone so confused about the Preuss trade?? I think most "pundits" are confused from Preuss' perspective as to why he wouldn't have sought out a number 1 ruck spot. You'd have to be blind freddy not to see it from our perspective. I would have thought that gives you more than a C+ but who cares. In the end it's all about premierships. We need to start winning them again. Wallace, I do not rate as a judge of anything. The more I think about the trading period, the happier I feel about the outcomes for the MFC. And, the happier I feel about the performance of our key managers. I don't think Plough is that far off the mark. The big winners of the trade period were Richmond, Essendon and Collingwood who all picked up star players for nothing or cheap value. We came out with a C+ despite not winning on any individual trade. The grade I would question most the D+ on Geelong given they picked up Dahlhaus for nothing. I think he penalised them for not getting the Kelly trade done, but I don't think that is really fair. Preuss has addressed this himself. He said he wants to learn and play under Max Gawn. I agree - I can't quite equate the grade given with the words written. 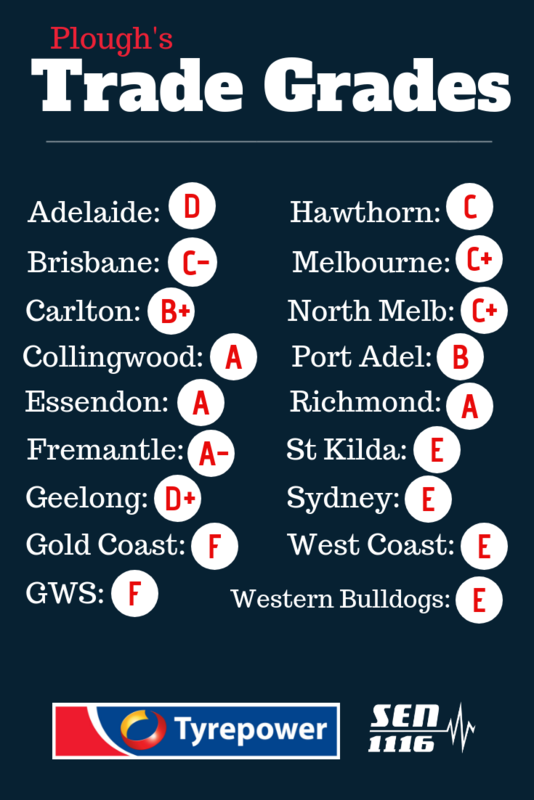 Collingwood ignored their weaknesses and topped up their already strongest area. These blokes must be on commission jobs. Preuss can kick goals, but has never had an opportunity at NM. Don't be surprised to see him do just that. May, can kick miles and goals. Don't be surprised to see him do that, and be angry to big heads like cats and pies. Wonder what he thought about how this year we finished third on the ladder, and where he thought we would finish!!! You had me at "Wallace is confused"
iMO getting Preuss is simple. We had no backup for Gawn. King and company were not even VFL quality , week in week out Casey played to losing rucks. Over the last two years I did not see them win the position once in fact I never saw them break even. Jesse was going anyway this year or next. Letting him go this year for trades to acquire established seasoned players was smart. It is not certain that even a first round draft pick next year for Jesse would have been better. Our record shows that, while Jesse was a real contributor to high goal scoring, we scored highly and won many games without him - think weagles, GWS, cats and dorks this year. Bringing in a gorilla minder to stiffen up a backline with stoppers such as Jetts and OMac and running attacking players such as Hibbo, Frosty, Jades, Sales, Leaves shows strategic planning. May was not my preferred choice but he was selected to plug a hole and play a role. If he does his job, we might stop the leaking and, together with any goals scored by Jesse's replacement, break even on goals. As weagles showed this year, two ruckmen are better than one if used intelligently. Highlights of Preuss show a big, strong, mobile, marking ruckman who can score goals. Imagine Maxie patrolling the backline and Preuss frightening the opposition in the forward line. If this can be pulled off it could be the master stroke of the decade. Wallace is a blunt, soft, broken tool. I’ve never rated Wallace, and still don’t. I'm confused as to how he could possible be confused about Preuss, he is probably still confused as to how West Coast won the GF with 2 ruckmen, or judging by above even more confused as to why they were even in it. Good reason why he doesn't have a job coaching. It really is a 'no brainer'. Now I'm truly confused as to how Wallace is.... especially as he'd qualify !! Got a gun key back, added some outside run and also got the perfect back up for Max... and it's a C+? Hogan is a decent loss, no doubt about it, but we have the coverage. In the end, he can rate ours all he likes, but we won't know how we truly went for a while yet. These grades are meaningless really. He is mixing bits up when scoring us. Why we took Preuss is not confusing. Why he chose to come could be confusing. Its like saying why would Hogan want to leave a team on the verge of success to go to the exact opposite and then marking Freo down for it. Just by moving Hogan on should move us up to a B. The proof is there as demonstrated in most of the games he didn’t play during his tenure with us. His rating system has a lot of grades A- and B+, C- and D+. From A to F that gives 16 different rating levels and that's leaving out A+ and F-. Put them on the line Terry and be more definitive.